Well the election result was not unexpected and favour Independence. However I still consider the whole situation as bizarre in modern day democracy of a civilized and prosperous nation. I would even go on to say that everyday life in most of Spain has (and will continue) ever since the end of the dictatorship whilst politicians of all sides have gone on another with one specific purpose - power at whatever cost. Suffice to say that future historians will have a field day analysing the events. What is certain, however, is that this is the end of the beginning of a new phase to an ongoing saga that was triggered in 1934 and suppressed for 40 years, only to resurrect from the ashes in 1978 thanks to an extremely liberal (coffee for everyone) Constitution that allowed all this to happen. One thing is certain - added to what I have already given - is that Puigdemont is no longer president. He is free to come back to Spain to face the music of his impending arrest. However, what will happen to him as well as those that are arrested remains to be seen. Ciudadans (the every-which-way party) lead by Albert Rivera is now in a powerful political position with 37 seats - not only in Catalonia but in Spain. He is young, ambitious, sensible and very pro-Spain and its democracy. As I mentioned in previous essays, he lacks proper government experience but has the making of a statesman badly needed in Spain at the moment. Ciudadans President is a Ms. Ines Arrimadas who is a stabilising factor. As planned, the election campaign in the autonomous region of Catalonia has begun and despite most of the present deposed members of the separatist parties either in jail or exiled in Belgium these have announced that they will once again present themselves as candidates. It’s turning into quite a jamboree. The present deposed president, Sr. Carles Puigdemont is campaigning away in Brussels with dozens of television and other media interviews. He has even lambasted the EU Commission because Mr. Junkers has told him, yet again, that Catalonia would be out of the EU if they declared themselves independent. Sr. Oriol Junqueras, the deposed vice president and secretary of the left wing Republican Party (ERC) is in jail carrying out the same campaign. Ironically, the opinion polls show a fifty-fifty balance between the separatists and the constitutionalists, i.e. those wishing to leave and those still considering themselves as Catalan as well as Spanish. What has emerged in all this mayhem has been - at last - admittance by Puidgemont and his coalition that the proclamation of independence by the Catalan Parliament was a symbolic gesture. They never intended to go ahead and close the gate on Spain. Why? And here comes the crunch. They never did have a post-exit plan in the first place. In other words, a complete bluff! As a comparison, it’s as if the Brexit referendum result was followed immediately, the very next day, by shutting the door on the EU (June 26th). Unbelievable! But what does all this mean, or even worse, imply? That Catalonia is still in a political upheaval, and will probably be after the elections on the 21st of December. More companies have moved their HQ’s to other parts of Spain. On another issue, Spain’s president, Sr. Mariano Rajoy, has urged Spaniards not to boycott Catalan products. Similar to the UK and the EU, thousands of products are the result of an exchange of autonomous region materials. In other words, as an example, an item ending up on the supermarket shelf may contain ingredients from the autonomous region of Andalusia. Catalonia produces most of the champagne bubbly (example is, the well-known Freixenet). All the corks are produced in Extremadura. Christmas and New Year are just around the corner. Another blow was the move of the European Union pharmaceutical agency from the UK to Amsterdam with the loss of 900 jobs and another 35000 temporaries. It was destined for Barcelona as the European city that provided the best location. The final uncertainty is that the constitutional parties, Conservatives (PP), Socialists (PSOE) and the every-which-way party (Ciudadans) cannot get their act together in some sort of a joint coalition to save the day and return Catalonia to what it was long before the separatists decided to break up the country. Why? The socialist leader, Sr. Pedro Sanchez cannot shake off his personal dislike of Sr. Rajoy (PP) and refuses to cooperate. Crazy! Although the Catalan issue is by far the most important problem facing the nation that requires a positive solution, other situations that affect life in general are daily front page news. As a summary we must begin with the fraud issue that started years ago that continues to haunt the present government and the party of Sr. Rajoy. It has lead to, and still continues to uncover new fraudulent members of the party. Although some are in minor positions of power, someone emerges on some charge or other that causes a stir amongst the opposition. It obviously hits the news. However, those on the other side of the fence - the opposition - are not immune, but then they are not in the driving seat. The massive extreme left driven by Sr. Pablo Iglesias of Podemos through the social media network continue to keep up the rhetoric. And yet they are up facing the music because of supposed party funding from Venezuela and, wait for it, Iran! The macro-economy, praised by the outside world still does not filter down to the daily bread on the table of the lower paid or those on the dole. Unemployment is down and job creation on the rise but the statistics do not include the thousands of zero hour jobs that are not only temporary - down to days or even hours - but extremely low paid, despite the rise in social security and tax payments. The whole labor law needs a complete rehash to face the future competitiveness of the country. Sr. Albert Rivera of Ciudadans has been harping on about this for years. His idea of a single contract for everyone makes sense but the rest of the parties, including the trade unions do not wish to know. One sector of news that has hit the European press is the dreadful drought that Spain has been suffering for the past 3 months. It just hasn’t rained! The majority of the reservoirs, ironically built during the Franco dictatorship are at a minimum level not seen for over 60 years. As I go to press, some rain has started but hardly sufficient to satisfy the demand. Galicia, normally a rainy area, has barely a month or two of supply left. Rationing is in force. This follows a dreadful season of forest fires. The city of Vigo was totally surrounded. A drive in the surrounding countryside paints a Dantesque scenario that will take the woods at least another 20 years to recuperate. Talk about climate change! We will be entering the end of year festivity season that include Christmas, New Year and ‘Reyes’ (the Three Wise Kings’ fanfare). Add Cyber Monday and most of those who have a few shekels will be on a spending jamboree. The government has announced that the economy is forecast to grow by around 3% next year adding a positive outlook for the future. A final word is a short mention of the Brexit affair. Many Spaniards are returning from the UK because of the uncertainty of maintaining their status quo that includes a guaranteed future residency. Brits in Spain still lobby the Spanish government not to lose sight of their own uncertain future. Both feel that the talks going on between the British government and the European Union are not encouraging. Citizens’ rights and the free movement of people, although ‘mentioned in dispatches’ are definitely on the back burner. All being well, see you next year. What happened on ‘D’ day 1st of October? 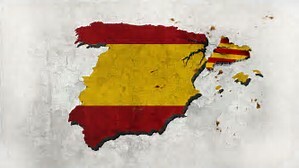 One thing is certain, whichever way the pendulum swings it's going to mark a new era that will change Spain for good. For better or for worse is yet to be seen.